The Tate Chair Cream provides a striking yet comfortable accompaniment to the dining table. Designed with versatility and a combination of retro and modern style, the Tate will fit nicely in many spaces, from the dining room to the study or even the bedroom. 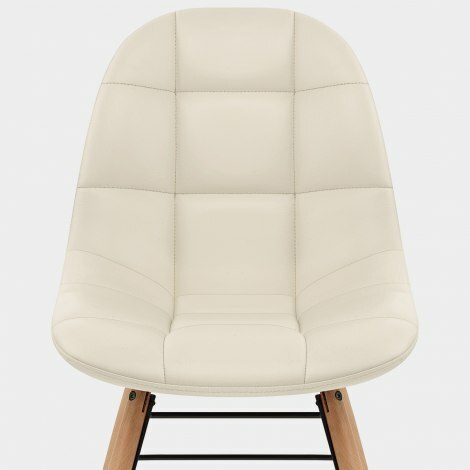 Upholstered in chic cream faux leather, the ergonomic seat is filled with dense padding and has panelled stitch detailing as a chic touch. Four solid wooden legs create a firm and supportive base, while chic black satin braces reinforce the frame and make a cool contrast with the oak finished legs. Completed by protective plugs on the underside of the feet, the Tate is a funky design that is full of character. "Hard wearing and luxury looking all in one"
Chairs came very promptly indeed. They were quick and easy to assemble (just bolting legs to main structure). The quality certainly looks to be good at this stage and they are definately very comfortable. They are a stylish addition to oir new apartment. One of the most comfortable dining chairs I have say upon. 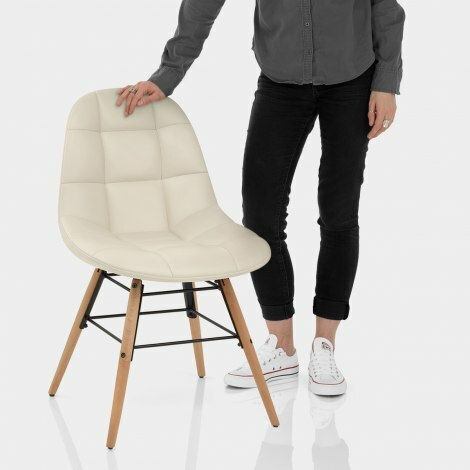 The Tate chair is stylish and good value for money. In love with these chairs! They match my kitchen perfectly, are hard wearing and luxury looking all in one!